It’s official: The Bar Has Been Raised. selection of beer style and marriage of flavors. local tasting event of this scale and magnitude. And, to put a cherry on top for all things local, the event was also a fundraiser for Indiana’s Greenways Foundation. The event was a joint effort between Indiana’s own W.H. 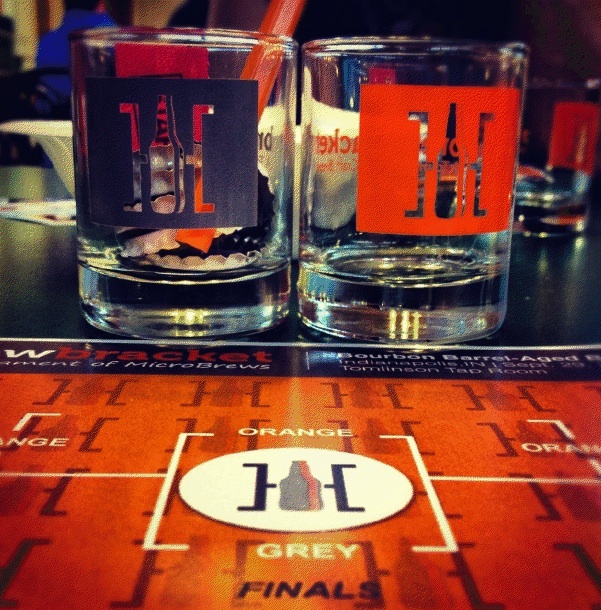 Harrison Bourbon (@HarrisonBourbon) and Brew Bracket (@BrewBracket), a competition event where craft beer fans get to blind taste and vote for their favorite beers in a March Madness- style taste-off, the creation of Mike Sale and Ryan Coyle. 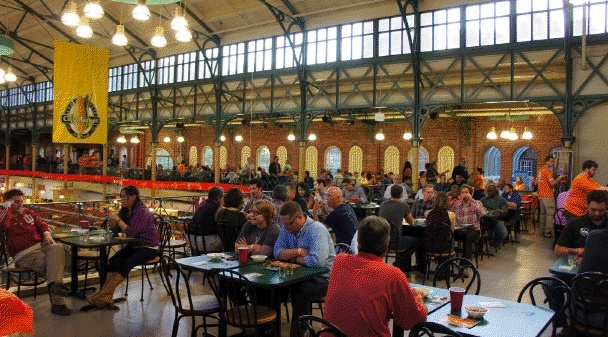 The tasting was held in downtown Indianapolis’ historic City Market, at the Tomlinson Tap Room, a bar owned by the Indiana Brewer’s Guild that serves only local beers, wines and spirits. Triton Brewery (Indianapolis): Cherry Oatmeal Stout aged in a Harrison Bourbon barrel. Bier Brewery (Indianapolis): Billy Baroo, a Russian Imperial Stout aged in a Harrison Bourbon barrel. fermented in a Harrison Bourbon barrel. Peoples Brewing (Lafayette, IN): Duncan’s Scottish Ale aged in a Harrison Bourbon barrel. aged in a Harrison Bourbon barrel. 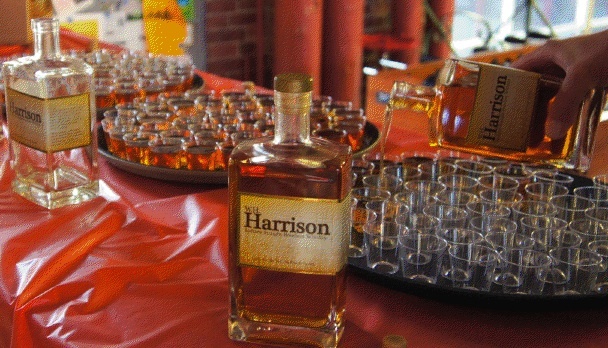 At the start, tasters were given only a blank bracket form for notes, two beer tasting glasses (orange vs. grey), orange and grey bottle caps for voting, and a ration of Harrison Bourbon. As the event progressed, a small army of servers brought pitchers of two beers at a time, simply labeled ‘orange’ and ‘grey’. 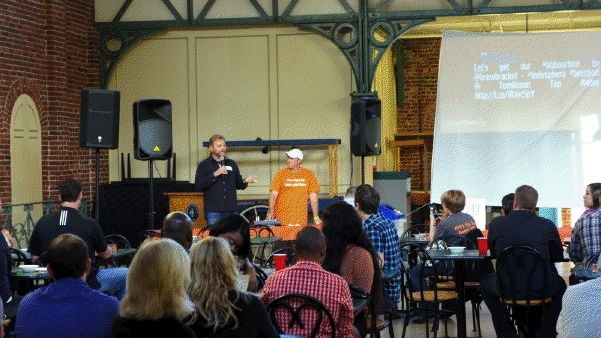 After tasting and evaluating a pairing, the crowd was able to vote for their favorite with orange or grey bottlecaps, and the winner – brand still unknown – was announced and advanced to the next round. Combining this with emcees, a live tweet wall (#BBBourbon), a table full of raffle swag, and great music made for a fantastically entertaining adventure and a lively, cheering crowd. At times when “orange” or “grey” chants broke out, you could close your eyes and imagine being in a bar during the Final Four. led to a shortage of used Bourbon Barrels nationally. After all of the tasting and voting was completed and tallied, the blind brackets were filled in and revealed on the tweet wall for the first time. The two finalists were Barley Island – whose brown ale brought fruity accents that complemented the beer and the bourbon flavors exceedingly well – and RAM’s Maibock, which carried over the butterscotch, caramel and vanilla notes of the Bourbon into the beer in a dramatic and deliciously forward palate that was a real crowd pleaser. The winner, RAM head brewer Andrew Castner (second from left) will celebrate with more Maibock and more Bourbon. 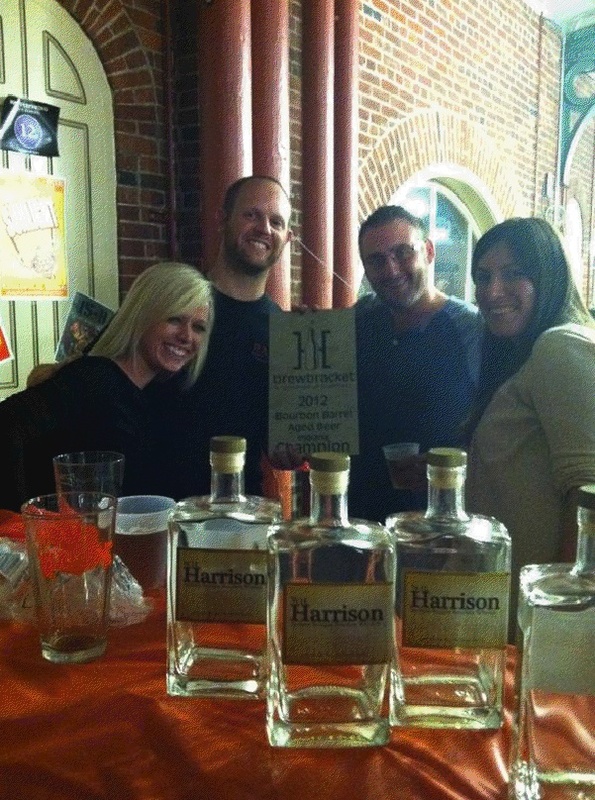 the restaurant, and plans are being made to host a special event with Harrison Bourbon to tap the rest of the supply. Details will be announced on facebook and twitter by The RAM and Harrison Bourbon. Hundreds of Harrison Bourbon samples being poured for taste comparison with the beers. Hosts Jerry Knight Owner of Harrison Bourbon (left) and Ryan Coyle (right) under the tweet wall.